Cream Tartar Doughnuts. No. 2. 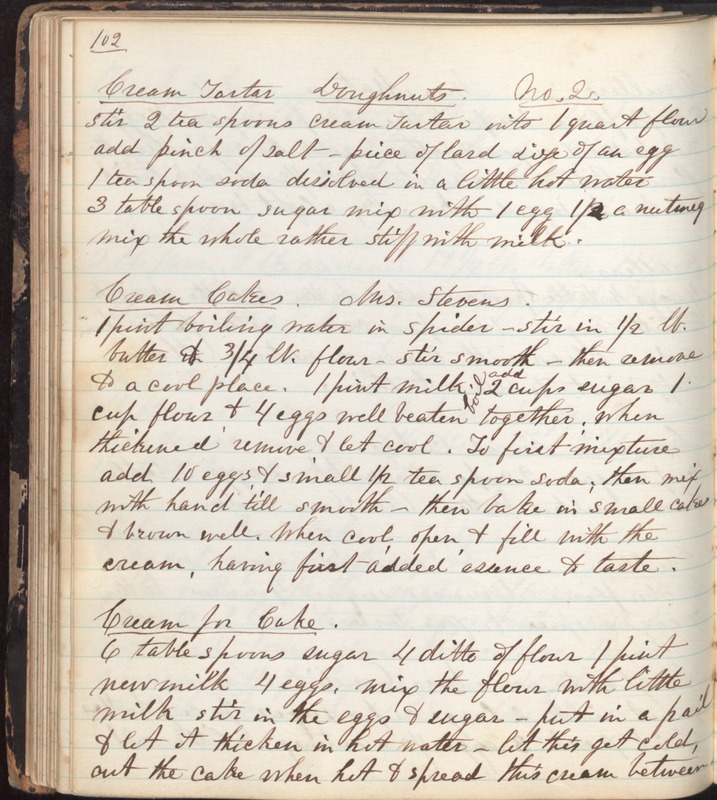 Stir 2 tea spoons cream tartar into 1 quart flour add pinch of salt - piece of lard size of an egg 1 teaspoon soda dissolved in a little hot water 3 tablespoon sugar mix with 1 egg 1/2 a nutmeg mix the whole rather stiff with milk. Cream Cakes. Mrs. Stevens. 1 pint boiling water in spider - stir in 1/2 lb. butter & 3/4 lb. flour - stir smooth - then remove to a cool place. 1 pint milk boil add 2 cups sugar 1 cup flour & 4 eggs well beaten together. When thickened remove & let cool. To first mixture add 10 eggs & small 1/2 teaspoon soda, then mix with hand till smooth - then bake in small cakes & brown well. When cool, open & fill with the cream, having first added essence to taste. Cream for Cake. 6 tablespoons sugar 4 ditto flour 1 pint new milk 4 eggs, mix the flour with little milk stir in the eggs & sugar - put in a pail & let it thicken in hot water - let this get cold, cut the cake when hot & spread this cream between.